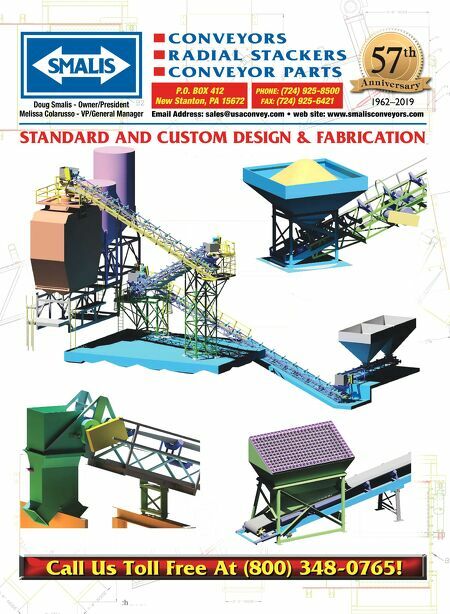 www.rockproducts.com ROCK products • March 2019 • 87 WE STAND FOR OUR FLAG INTERNATIONAL MATERIAL HANDLING EQUIPMENT LTD. C ART ER ' S CALL TOLL FREE: 800.548.6374 P.O. Box 87 • 1508 17th Ave. East • Oskaloosa, Iowa 52577 • (641) 673-8491 Fax (641) 673-8494 E-Mail: cartersintl@lisco.net WE STAND FOR OUR FLAG Looking to save TIME & MONEY? 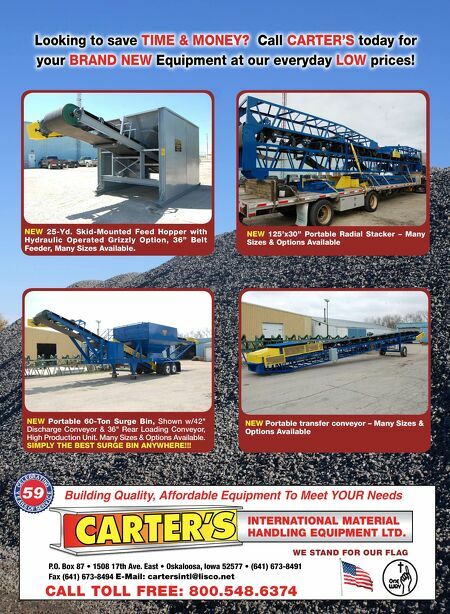 Call CARTER'S today for your BRAND NEW Equipment at our everyday LOW prices! Building Quality, Affordable Equipment To Meet YOUR Needs NEW Portable 60-Ton Surge Bin, Shown w/42" Discharge Conveyor & 36" Rear Loading Conveyor, High Production Unit. Many Sizes & Options Available. SIMPLY THE BEST SURGE BIN ANYWHERE!!! NEW Portable transfer conveyor – Many Sizes & Options Available NEW 125'x30" Portable Radial Stacker – Many Sizes & Options Available NEW 25-Yd. Skid-Mounted Feed Hopper with Hydraulic Operated Grizzly Option, 36" Belt Feeder, Many Sizes Available.